We’re taking a peek inside the classroom to offer students a sampling of what they might experience. This week we visited the Visual Arts Center (VAC) to see the making of the magazine 340 High Street. Ever flip through the pages of the VAC’s magazine that showcases the best work created by the talented students there? Inside 340 High Street, named for the VAC’s address, you’ll see the marvelous works of the VAC’s graphic design, photography, ceramics, glassmaking and fine arts students creatively complied into one publication. Every year the students in Communication Design (COM 252) design every detail of the magazine from start to finish, beginning with the initial concept of how the magazine is going to look without overlooking the most minute details such as how or if it’s going to be bound. Initially, each student presents his or her own concept for the design to Professor Heather Boone. She then divides the students into three teams who work together to develop an idea to present to VAC faculty. Once the winning design is selected, structure, template and design teams are formed to see the process through. This is the 18th year of 340 High Street; the 96-page magazine will be available in the spring, the culmination of a semester-plus of hard work. The class produces 1,000 copies. “This project is an example of real-world stuff. Everything I’ve learned so far is actual experience I can put on a resume.” – Kathryn Tucker, who will transfer her credits to earn her bachelor’s in graphic design from Arizona State University’s online program. 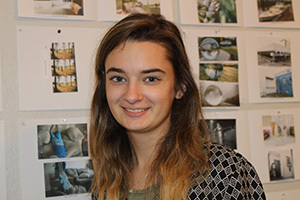 “For the first time in my life, I feel like I’m working on something that could really be like my real job one day.” – Jessica Faisca, who will graduate with her Associate of Applied Science in Graphic Design in December. “I like bringing all the aspects of everything I learned at the VAC together.” – Tyler Jessee, who will graduate with his Associate of Applied Science in Graphic Design in December. Boone has taught graphic design at Tidewater Community College since 2010. She earned her master’s and bachelor’s in fine arts from Virginia Commonwealth University. Her specialties include interaction design, front-end web development, print design publication, identity design, information architecture and art direction. Students love her for her wit and approachable personality.